I have owned the LílléBaby Complete All Seasons for almost a year and it is seriously my favorite carrier! I own several carriers, however the Complete All Seasons tends to be my go-to carrier. As a part of my ambassadorship with LílléBaby they sent me their Essentials carrier to test out and review. When I received the Essentials I was excited to try it and to see how it differs from my Complete All Seasons. All opinions expressed are my own. First things first, the name of this new carrier, Essentials, truly encompasses what this new carrier is! My experience has been that the Essentials gives me all of the basics that I need for a Soft Structured Carrier (SSC). The Essentials allows for four carrying options (front, hip, back, and front-fetal when infant insert is used) and can be used for babies and toddlers ages *7-45 pounds. This carrier also comes with neck support, three-way straps, a mesh hood for sleeping, shade, and/or nursing privacy, a pocket, that's perfect size for my phone, keys, and lip gloss, and it's machine washable. 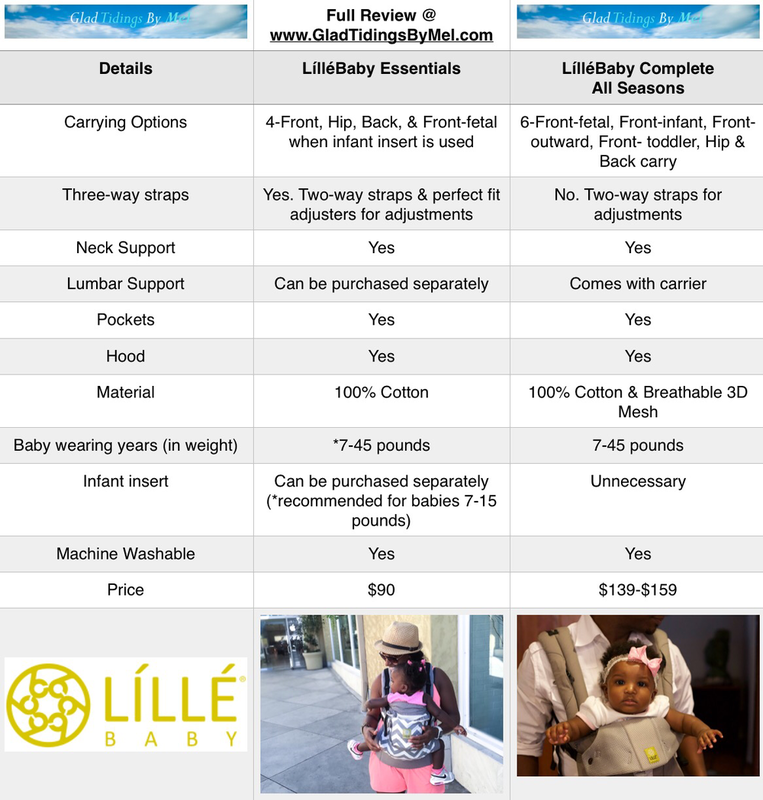 Due to the Essentials providing the basics of an SSC it happens to be less expensive than the LílléBaby Complete All Seasons. As mentioned above one of my first LílléBaby carriers was the Complete All Seasons. Now that I have had some time to get to know Essentials I can see a few differences. These differences are not good/bad, better/worse. They are just different carriers! I'm truly emotionally attached to my first LílléBaby so it will always be my go-to carrier. However, Essentials has grown on me! I have come to call my Essentials, Chevy. Yes, I named my Essentials. My experience has been that Essentials appears to give my children and I a snugger fit when I front carry with it. In the front carry position it feels like I am hugging my children; not just simply holding/carrying them. The Essentials has been easier and faster for me to put on in a hurry, so it has become my grab n' go carrier when I need to baby-wear quickly. Thus far, I have only used Essentials for quick, short-term carries, such as grocery shopping, finishing dinner, when my kids asked to be picked up, but I need my hands-free, etc. As of now, I will continue to use my Complete All Seasons for long-term carries and longer errand runs, etc. The main thing that reminds me of the **differences between LílléBaby Essentials and LílléBaby Complete All Seasons is this..... Think of LilleBaby as The Lexus of baby carriers. You're going to get a good quality carrier, no matter which of their styles you purchase! You can own multiple LílléBaby carriers or simply find the one that truly fits your family's needs. The Essentials is great, it comes with the basics, it costs less, but it does not slack on the LílléBaby quality. The Complete All Seasons comes with all the bells and whistles, so the price reflects that. The Essentials is your basic car model and the Complete All Seasons is your fully loaded model. I truly like both carriers and have fallen in luv with being able to have some variety in our baby/toddler wearing years. *Infant insert required to use the Essentials as early as 7 pounds. It is recommended that your child be at least 15 pounds in order to use the carrier without the infant insert. **Please see the attached chart to explore additional ways in which Essentials and the Complete All Seasons differ from one another and what they have in common.